Nasal Sanitizer® Nozaseptin® formula combines ethanol with antioxidant rich natural emollients. This provides a highly effective antiseptic for the nose in a pleasant and moisturizing application. 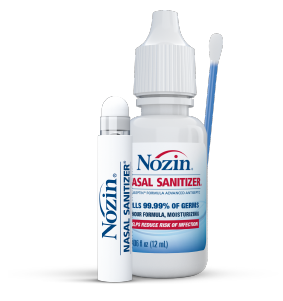 Explore how Nozin Nasal Sanitizer antiseptic compares with other Nasal Decolonization products in use today. Nozin® Nasal Sanitizer® POPswab® single use ampules. The applicator is specially designed from a soft material for a proper application that will be gentle on the nose. Samples are available for health professionals. Nasal Sanitizer® Nozaseptin® formula combines ethanol with antioxidant rich natural emollients. This provides a highly effective antiseptic for the nose in a pleasant and moisturizing application. Samples are available for health professionals. Experts believe the Nozin® product could have a major positive impact on current procedures and costs in the effort to reduce the risk of infections acquired in health care settings. Contact a Nozin Representative to learn about the Nozin Programs and get started on a solution for your facility. Doctors, PAs and Nurse Practitioners have recommended Nozin product to patients to help fight germs and improve nasal hygiene. Outpatient clinics and surgical facilities can incorporate Nozin Nasal Sanitizer antiseptic as part of infection control to help reduce risk of nasal carriage. If you are interested in Nozin Nasal Sanitizer samples for your clinic or physician office, please submit your sample request.